WANT TO CHECK IF YOU ARE REGISTERED? The 5K Run/Walk will find you shoulder to shoulder with fun runners and families, and those ready for a bit of exercise prior to a Thanksgiving Celebration. Toddlers in strollers are FREE and encouraged to participate. Children running or walking must register. Strollers and dogs on a leash are welcome to join but need to start from the back of the group (Dogs are not allowed on Thirlby Field and will be re-routed at the Start/Finish). The addition of the 5M Flier creates the distance challenge but still routes through downtown and back to Thirlby Field Stadium. This year, the race starts at Thirlby Field Stadium on 14th Street. Packet pick-up and pre-race will be at Thirlby Field as well. The 5K and 5M courses will run through downtown Traverse City. Participants receive a T-Shirt and fabulously stuffed Goody Sack, and enjoy fun entertainment along the route. The event combines families, fun and fitness. Canned good donations Trinity Lutheran and Students in Transition Empowerment Program (STEP) food pantries. All event proceeds going to local Charities. Race registrations will not be guaranteed a T-shirt after Tuesday, November 15th! 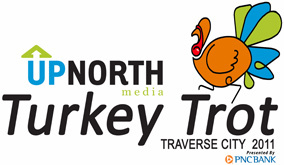 Up North Media organizes the FOURTH Annual Traverse City Downtown Turkey Trot, an event for Charities. Start and End running the field at Thirlby Field Stadium!